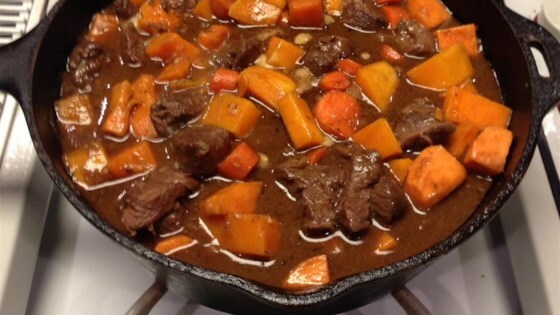 Heat the oil in a large saucepan, and brown the lamb meat on all sides. Drain fat, and stir in the beef broth and wine. Season with garlic, thyme, salt, pepper, and bay leaf. Bring the mixture to a boil. Reduce heat, cover, and simmer 20 minutes. Mix in the squash, parsnips, sweet potatoes, celery, and onion. Bring to a boil, then reduce heat and simmer 30 minutes, or until the vegetables are tender. In a small bowl, blend the sour cream and flour. Gradually stir in 1/2 cup of the hot stew mixture. Stir the sour cream mixture into the saucepan. Remove the bay leaf, and continue to cook and stir until thickened. Bland! Required additional seasoning. The lamb was definitely tender, but there was too much Butternut Squash for my own taste. I used this recipe several times last year. It is easy to substitute ingredients if need be and is a hearty evening meal when served with a fresh green salad and crusty bread. What an awesome combination of flavors! My family went crazy over it...fighting for the last serving! I have now even added carrots and turnips to the pot. This one is a keeper! This stew taste a little sweet, but absolutly love it.